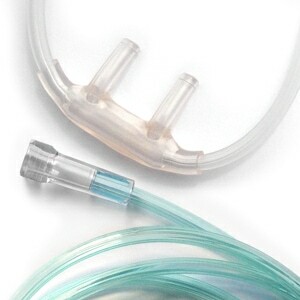 Each transparent green vinyl oxygen supply tube comes with standard connectors on both ends so that it is compatible with oxygen concentrators from all major manufacturers including Caire, SeQual, Inogen, Respironics, Invacare, ResMed, Drive DeVilbiss, and others. This tubing works much better than the thin light green tubing I received from my oxygen company. It does not kink. More robust than previous tubing. Had this product for over a month - never did straighten out.Curls up, tangles up, kinks up badly. Truly worthless product. The tubing was wrapped so tight that two of tubings were kinked so bad I threw then out. These are 50 feet not 7 feet. Tubing looks well made but kinks easily. Fortunately, the design still allows oxygen to flow through even when kinked. Delivery was exactly on time. Love Direct Home Medical! Always find what I need and free shipping too...why go anywhere else?? loved it. will use ya'll again, for sure. Not as relaxed as I would like. This hose still gets in the way and does not lay flat , but it is better than my oxygen supplier gives us . This tubing is a hundred times better than any other tubing I have purchased. 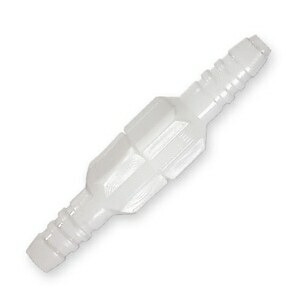 It may twist but does not crimp and cut off air supply. This tubing works great, and It's all I buy. Never kinks up, and easy to see on the floor. Direct Home Medical always sends it right out so we get everything very quickly. That is where I go to for our medical needs. Will not lay flat, coils up and creates trip hazzard, easily kinks. I have nothing good to say about it. I unrolled it very carefuly trying to eliminate coiling, didn't help. Glad I only bought two instead of falling for the quantity bargain!! Product received in good shape, Product was what I expected. The air line worked well when new but is now starting to link occasionally. I purchased a few 50' on Amazon. Received 25' that were thin, kinked easily and seem to wrap around my ankles with every step. Never again. There is such a difference in the quality and convenience with the Salter. And, I love the bright GREEN. THANK YOU. The tubing does tangle quite a but but has been manageable. This tubing seems to lay a lot flatter that the clear tubing making much easier to navigate with. I really do like it! it is flexible but yet sturdy. My husband LOVES it. The original hose he had didn't last long at all. It started leaking, getting holes in it. I found this one online. The price was GREAT. The quality is Awesome. It is wonderful. Thank you. Stronger than any other options and people see them. I love it, it is just what I needed. Your service is more than outstanding..I'll be back. I have always been pleased with everythinhg I have purchased from Direct Home Medical. AND love FREE SHIPPING. I love it. No kinks no curly Q's. Oxygen levels are great. I bought 10 50 footers, but now need some short ones. I gave one of the 50 footers to a friend so am hoping he will like them too. Excellent product and service. Always ontime delivery. Thanks for the great service. This tubing is awful! Not only does it knot up, it has so many pinches in the tubing I have thrown the last three in the trash! The first 50 ft green hose I purchased earlier in the year layed flat and did not coil up all the time like this one does. Plus it kinks all the time. The description said that the oxygen tubing will remain straight when uncoiled. Certainly the tubing I received does not remain straight, and continues coiling. I was really disappointed, because the product simply does not match the description DirectHomeMedical gave. Easy to see on the floor. Much better than the clear ones. It still gets twisted even with the swivel connector. I am pretty active so I guess that is why . Perhaps as it gets more use, it will not kink. After tubing crushed and twisted in 2 weeks I cut the tubing to discover no multi channel. Very disappointed in product. the crush proof tubing is real good and it stands out so no one trips on it. it doesn't tend to tangle up and lays flat. The smell is so bad that I'm unable to use it even after running air through it for some time. Customer service suggested that I leave it out in the sun for several hours; however, I haven't had an opportunity to do that. 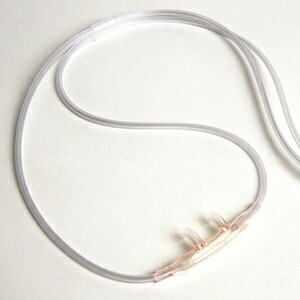 This 50 foot tubing is much nicer than the one that supplied by our O2 supplier. It stays much flatter on the floor, doesn't get twisted up like the other one did. That makes nicer for my wife to walk around our house without the tubing getting tangled up. Its great tubing except for the length of time for it to straighten out. I unpacked and hung it around the room hoping to ease its preferred coil state. Helped but we're still tripping and the pups occasionally "get caught". But once it settles down, its great! 50' tubing salter 2050g-50 KINKS!!!!!!!! This tubing is terrible, It starts kinking about ONE month. So bad, I think I'm only getting about 30'. I bought this because I was tired of kinks and not getting the oxygen flow I needed. Let's face it, it's bad enough we have to use oxygen, but to then have to fight for good oxygen flow is just adding salt to the wound, so to speak. This hose is worse than what I already had, having to rotate hose to get kinks out all the time. All I want is "hospital grade" hose, is that too much to ask. Very kink resistant and easy to get out if they occur. Sorry we won't be needing any more as the patient has passed away. I wish I had found these year ago! I've been on oxygen scince 2008. Every tube that the oxygen company has tangled,twisted and collapsed. This is great tubing. This product is excellent to be able to move around the house. Would recommend this product to anybody that needs some freedom. These Salter cords work great, are very sturdy and I would purchase them again. Easy for others to see. Carries the O2 easily for 50 feet. Non-crushable. They didn't tell me that it made people so angry! This is worse than the one that came with the air machine. It kinks and curls around its self so you end up getting caught on everything and ending up with a 10foot tube. I will try one of the other tubings that you have. I like the color as everyone can see it. I believe next time I would prefer the clear line, making it easier to see any water in line. As advertised, the tubing does not recoil after use and remains straight. Also noted that when using the concentrator humidifier, there is no moisture buildup in the tubing. My other tubing was much like an old garden hose constantly tangling up. Works very well and I have to ride over it in my scooter. The title says it all. The tubing started kinking after one week of use. I will be looking somewhere else for my supply tubing. Was exactly what was needed. Used for high volume oxygen from my oxygen machine. Perfect for use and does not kink as some other do. This product is perfect. I purchased this (out of my own pocket) that's how good it is. The supplies arrived in a timely manner and in pristine condition! People forget that any plastic tubing has a memory and in order to relief the memory one must sustain a very hot water bath for at least 2 minutes. By doing so, there won't be any kinks or memory. The hose is highly visible and lies relatively flat. thank you for a easy and prompt order. This green hose kicks way too much. Thought it would have been more resilient. I have tried various brands of oxygen tubing and this is by far the best I have found. The green color is easy to see and the way it is constructed there is no dangerous looping that causes a trip and fall hazard. My husband and I each fell once because of the other kind and once was more than enough. After two days use, thegreen tubing assumed a life of its own and began to kink-up. It's better than the clear tubing, though. This tubing retains is kinks after uncoiling (even after being stretched), does not lie flat, and tends to coil up. It is simply not rigid enough. But it appears that there is nothing better on the market, so this is as good as you can get. This is my second purchase of this item. It performs so much better than the clear more rigid tubing we were supplied with by the Oxygen supply company we have fulfilling the prescription that our Dr. ordered. We love it and will continue to order it as needed. This tubing is durable and allows me to work all through the house without dragging my machine everywhere. Keep my machine in the upstairs hall and can use upstairs and also downstairs. Love it! Excellent product, works so much better than the plain white tubing we got with our home oxygen concentrator it doesn't tangle an bunch up and seems to have much better oxygen flow according to my wife. Will recommend it to anyone who shows interest. Very pleased with the product. It arrived in quickly and was packaged well. Very happy with the product and with Direct Home Medical. The 3 channel, crush resistant tubing is great. It doesn't kink and also the green color makes it easily seen on floor and eliminates trips and falls, especially for guests who are not used to watching for tubing. Delivered promptly and packaged well. I need the 50' length to be able to go from one side of my house to the other. If I connect two 25' lengths of tubing, the connector is always getting stuck under doors, furniture, etc. and may cause me to fall. This length is great and it does not twist. Thank you! I didn't find it better than the regular tubing I've been using. It seemed to tangle more. I have ordered this before. This doesn't seem the same. The other green was a little heavier tubing I thought. Much better than this. This is like any other green tubing. If I had ordered it somewhere else, my apologies. I needed a supplemental hose without all the cannulas and this fit the bill. I have so many extra cannulas and I now use trans tracheal oxygen so didn't need any more cannulas ever! to say the very least , I am so pleased with this tubing,,,it opened up and stayed flat....no tangling or kinking up....I have put up with the original one the oxygen co. sent me for 2 months and I was constantly untangling it!!! really stressful...this is a blessing and I am ordering another today....thank you. The hose was supposed to be kink free on the first day I used it the tubing tied itself in a knot. Lays flatter and doesn't kink as easily. Like it, not perfect but is a lot better than the normal tubing. The package arrived on time and in great condition. This distributer is wonderful to do business with. This is for my wife's concentrator. I like the green tubing better as is does non kink and it is crush resistant. Never tried to prove the crushing part. Tubing still has 'memory' and wants to coil up when uncoiled. Like the green color as it makes it more visible to others when I am walking around the house so they don't trip over it. Wish that it would lay flat and not coil up. This hose lies flat on the floor and does not kink. It is a great safety improvement over the hoses that are usually dispensed by the oxygen providers, which look the same but are not. 50 foot green concentrator tubing. I AM VERY HAPPY WITH THIS PURCHASE..I GOT THE DEAL OF 5 TUBING'S FOR SUCH AND SUCH AMOUNT... IT WAS A FAST DELIVERY ..PRODUCT WAS AS DESCRIBED I PUT IT ON MY MACHINE AND WAS UP AND AT IT.THANK YOU SO MUCH..WILL ORDER FROM HERE AGAIN. I bought this hose for a friend. Her cats tend to chase and play with her hose as she is moving around her house, and I thought this hose might survive this better than the hose she get from her oxygen supply company. Not only has this been the case, but she also informs me that the quality of the supply air from her oxygen concentrator is improved. In addition, your prices are better! This tubing is awesome. It does not tangle up like the ones I have gotten from other supply company. Will buy this product again. Over the past three years I have dealt with other clear tubing which always tangled and crimped. I am thrilled with the green crush resistant tubing and had managed to get a 50 ft. line from my oxygen provider during the last six months and no more kinks or tangles. I have purchased my own durable equipment and wanted to be sure I have the tubing I want. I ordered the new one from you and will continue to order from your company whenever I need new supplies for my oxygen usage. Your company did an excellent job of handling my order, speed of delivery, and follow-up. Thank you. The 50 foot tube allows my mother to go all over the house and I dont have to worry about the tubing detaching. Super delivery and I am very pleased with the purchase. This is the best tubing I have found. It really doesn't kink. 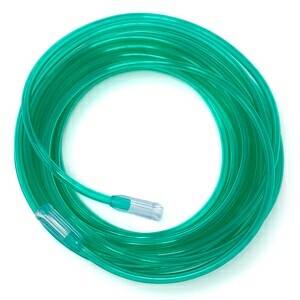 I ordered this because my insurance company's supplier of oxygen tubing provides tubing that kinks, gets all twisted up, and in general is dangerous. I called them about it and that's what they supply, and it's like "get used to it". So I went looking for an alternative and found the tubing you supply which is made by Salter Labs. It's perfect. Does not crimp, kink and otherwise get all tangled up so that you have to unhook it and try to straighten it out. Product was what I wanted and fast delivery. I couldn't ask for more. The product is very good. Much better then I get at the local medical supply stores in my home town. Do not curl up and get tangled as do other tubes.